Sorry, Batman fans. You can’t carry your superhero weapons onto planes. 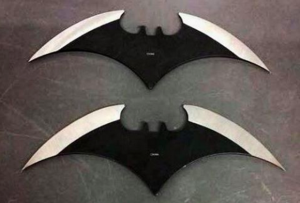 The TSA has reported an influx of people trying to bring aboard “batarangs,” which are sharp, bat-shaped weapons, NPR reports. The “batarangs” are being confiscated at airport security checkpoints. The TSA said it occasionally has problems with people thinking they can bring superhero weapons on to a flight. What Would Donald Trump’s Department of Justice Look Like? Posted: 8/3/16 at 8:56 AM under News Story.